Running in Portland, Maine. Best routes and places to run in Portland. 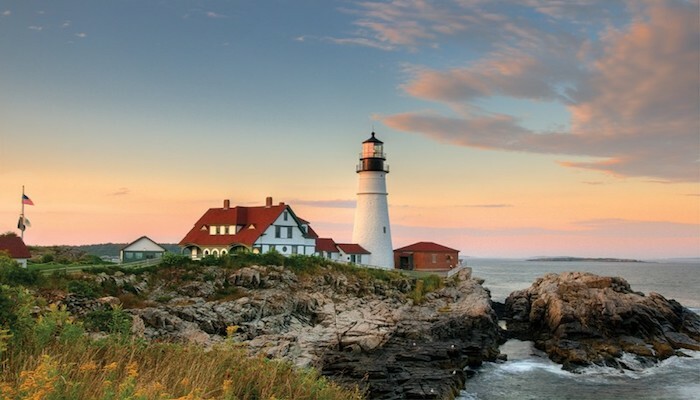 Lobsters, lighthouse, and ocean— the things that come to mind when you think about Maine’s largest city. 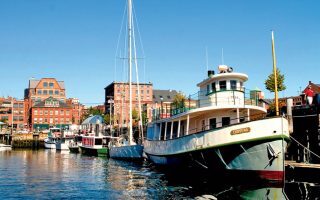 Portland is one the few working waterfronts left in the United States, acting as New England’s largest tonnage seaport and second largest fishing port. The city is located on a peninsula in Casco Bay with access to many islands. 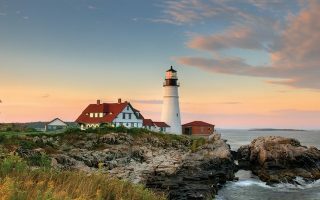 Tourists flock to the city to visit the historic Old Port, the Arts District, and the Portland Head Light, located in nearby Cape Elizabeth. Portland is known for its hip culture, with a mixture of arts, outdoor activities, fashion, and amazing culinary scene. 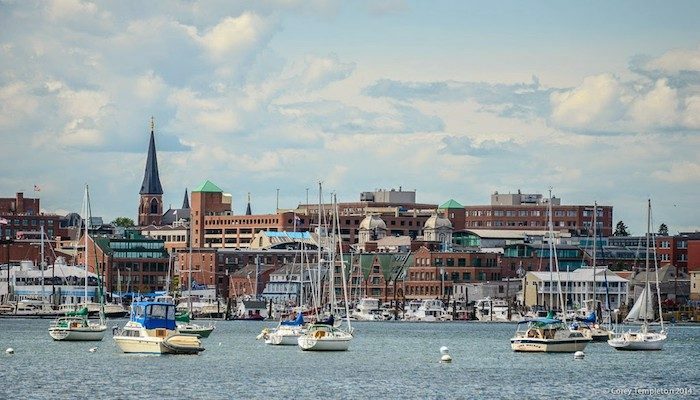 This is our guide to running in Portland, Maine. Portland’s running highlights center on the ocean. The Eastern Promenade and Back Cove are the must-dos from downtown. 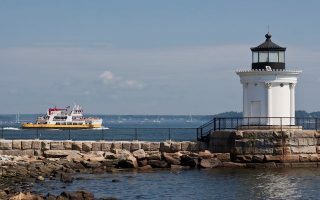 The Harborwalk is a great way to explore east and south Portland, and a lighthouse, while Cape Elizabeth features Portland’s swankiest real-estate and some lovely running. Our runs in the downtown and southern Portland areas can be standalone or easily mixed and matched. For more, see our extensive guides to the Southern Maine Coast and the MidCoast. This is a fairly small city with a compact downtown. Central Portland is a peninsula inside of I-295 and has many of the city’s commercial highlights. Cross the Casco Bay Bridge to get to South Portland and Portland Head Light. Cape Elizabeth is 8 miles south of downtown. One of Portland’s centerpieces, running from downtown, along the water, to Back Cove. The waterfront trail is built along an old rail corridor and offers spectacular harbor and ocean views. One of the most popular trails in Portland. Amazing views of the Portland skyline, with water views for the entire 3.5 mile loop around this nearly circular estuary basin on the northern side of the City of Portland. 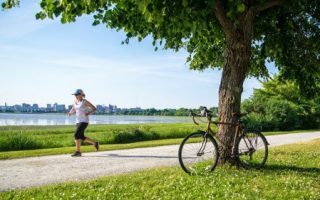 Stretching 5 miles from Portland’s southwestern border through a number of neighborhoods before ending overlooking the Eastern Promenade on Munjoy Hill. A good way to anchor a run in Portland. 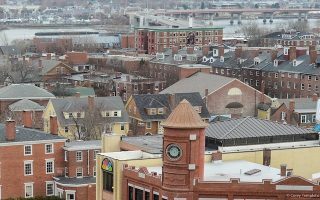 This is a nice tour of Portland’s Old Port main downtown area. Old Port is one of the most successful revitalized warehouse districts in the country. A lovely run through the West End neighborhood, famous for its architecture and boasts some of Portland’s largest historic homes including the historic Victoria Mansion museum. 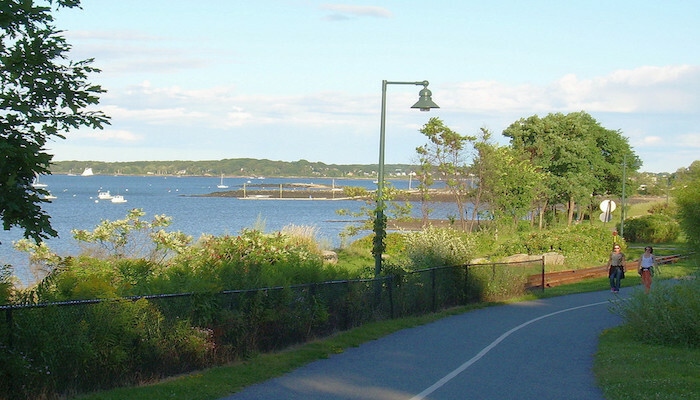 A 5 mile section of the 65-mile Eastern Trail bike path that runs through Portland, starting at Bug Light Park. Great views and home to the Portland Breakwater Lighthouse. A ‘tour de Portland’, connecting Portland’s East End beach and South Portland’s Bug Light Park.There are water views and a dedicated path most of the way. 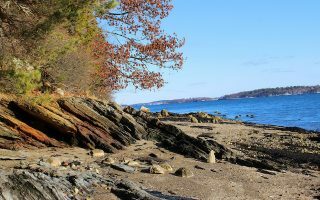 Take the 20-minute ferry over to Peaks Island, and enjoy a wonderful 4-mile perimeter tour of the island, with great water and Portland skyline views. 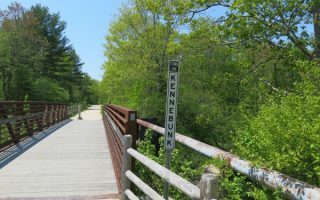 A great loop starting at Back Cove, Portland, crossing the Presumpscot River, and doing a quick tour of the island, with its rocky shore. There are no really long beaches for running right in Portland. 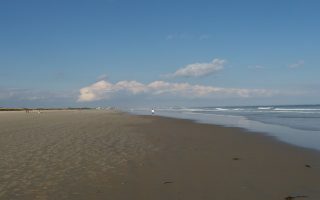 But two of Maine’s fabulous running beaches -- Old Orchard Beach & Ogunquit Beach are 1/2 hr. away. Here's our guide. Wonderful off-road running between Portsmouth and Portland. 30% of the 65-mile trail is complete. Mainly inland, through woods, marshes, & farms. Brochure, with detailed maps, is a great resource for good roads for running in the area as well. Portland is a northern city whose climate is influenced by the ocean. Summers are mild and pleasant, with high temperatures averaging near 80F (26C). It can get humid. Winters are very cold, but somewhat moderated by the ocean, compared to interior and northern parts of Maine. Average January highs are near freezing with lows 13F. Portland receives about 60 inches of snow a year, so snow-covered and icy roads and paths are a factor in winter. 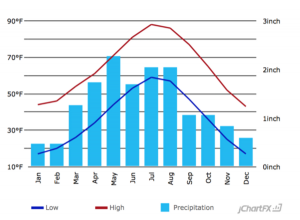 Annual precipitation averages 47.2 inches, copious year round, but the summers tend to be slightly drier. Fall is gorgeous and hangs on till the end of October. From hotels to B&Bs to lodges and cabins, Portland has something to accommodate everyone. To ensure the stay of your choice, it’s recommend that you make reservations in advance. 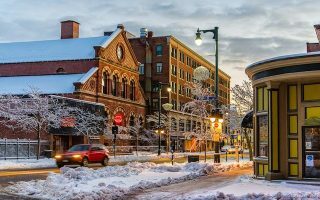 Room availability can be limited, especially during the peak summer and fall seasons, and in the Old Port and downtown areas. If you want to be right near the running trails, look in the Back Cove neighborhood, which is bordered by the trails and Baxter Boulevard. Looking for quick access to downtown? Bayside is a centrally-located neighborhood with easy access to the heart of the city. If waterfront views are your thing, check out Munjoy Hill. 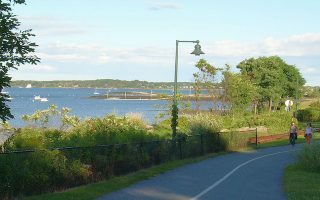 It is on the eastern edge of the Portland peninsula overlooking Casco Bay and encompasses the Eastern Promenade, a scenic waterfront park with a small beach and bike path. For more information on where to stay, click here. Fleet Feet Maine Running: Originally the Maine Running Company, Fleet Feet Maine Running is Portland’s principal indie running store. Check out their various events throughout the year here. Group Runs Tuesdays and Thursdays at 6pm. They also have a store in Brunswick, ME. RunWESTIN™: The Westin Portland Harborview Hotel has running concierges, who lead guided group runs every Tuesday and Thursday at 6:30 am (weather permitting) from their lobby. Runners of all levels are welcome. Running Calendar, from the Maine Track Club. 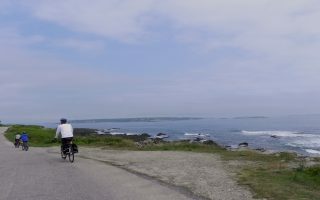 Maine Coast Marathon & Half-Marathon: Experience the coast and enjoy the beauty of springtime in Maine as you run along the coast in Kennebunk, Kennebunkport and Biddeford Pool. 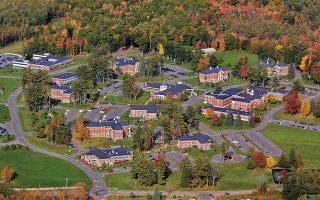 Do all that while running for a great cause: the Shipyard Maine Coast Half Marathon benefits Southern Maine Health Care’s Center for Breast Care. The half marathon is a relatively flat course that winds through coastline and coastal towns like Biddeford. The race start and finish is at University of New England. The Maine Coast Marathon is a USATF certified course which makes it an eligible Boston Qualifier course. It rolls through Kennebunk, Kennebunkport, Goose Rocks & Fortune Rocks Beach. Maine Marathon: Held in October, the Maine Marathon features a moderately hilly out-and-back course for all three races — marathon, relay and half marathon. It starts and finishes along the beautiful inner bay, Back Cove. Proceeds from this year’s race will go to benefit the Dream Factory of Maine,which grants dreams to critically and chronically ill children from ages 3–18.